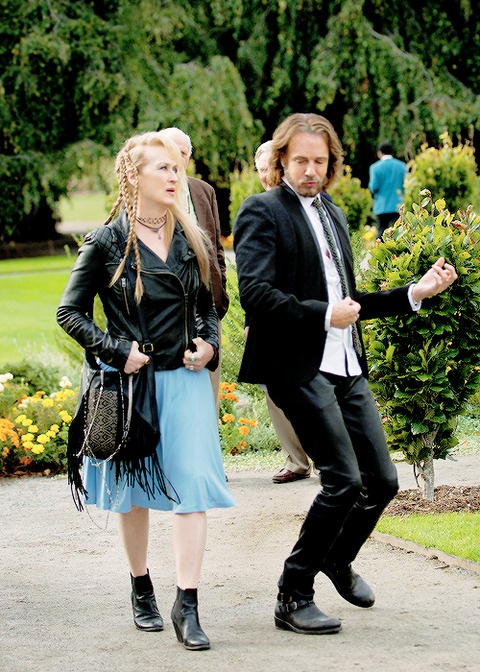 I cam across the latest production still of Meryl in Ricki and the Flash. She's obviously joined by her co-star Rick Springfield. The pair seem to be attending some kind of semi-formal event, possibly a wedding? 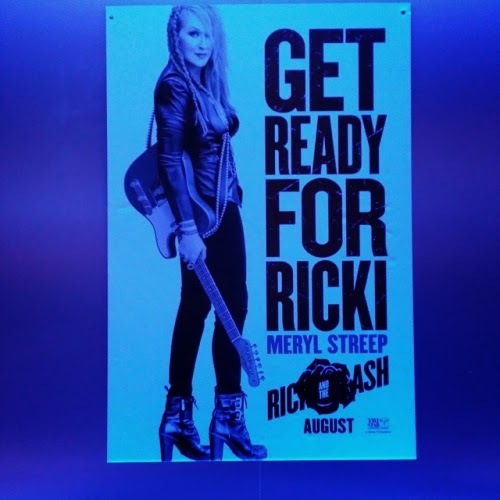 There have been a few pics/posters and articles on Ricki in the last several days, seemingly leading up to a trailer which I hope we can expect within the next few weeks. As she has in previous years, Meryl attended the Women in the World Summit on Wednesday evening in New York. She happened to be interviewed by Jon Stewart as a member of a panel which included filmmakers Ava DuVernay and Sharmeen Obaid-Chinoy. Most of you know that on this blog I usually stick to topics pertaining to Meryl's screen work. I have, however, been known to dabble in covering her participation in any number of good causes. Last night I was able to catch part of the original streaming of this interview, and right before the discussion began, they showed Streep's performance in her upcoming film Suffragette. The clip they showed looked to be the entirety of Meryl's performance, but unfortunately it is not included in the clip below. Regardless, more pearls of wisdom from our girl, coming off the heels of her personally funding a screenwriting lab for women over 40. Meryl looks pretty bitchin'. JJ Duncan from Zimbio also happens to think this will nab Streep her 20th Oscar nomination, as the few minutes of film showing Meryl were apparently rather impressive. Couple that with another transformative look, and it's hard not to agree that she'll easily be in the conversation for awards consideration. Rumor has it that we can expect the first trailer in the second half of May. Several sources are reporting that Meryl has provided a "substantial" financial contribution for a New York Women in Film and Television lab involving women screenwriters over the age of 40. The lab will be held over three days in September of this year to foster the talents of female American filmmakers, who currently make up only 11% of writers for top-grossing films, according to the Vanity Fair article cited. Meryl is certainly no stranger to involvement with women filmmakers. Over the last decade, Ricki and the Flash, Hope Springs, The Iron Lady, It's Complicated, Julie & Julia and The Devil Wears Prada were all pictures penned by women. Although I don't imagine all female screenwriters over the age of 40 write exclusively about women, their perspective needs greater representation in the current state of cinema. Hopefully Meryl won't be the sole beneficiary from a proliferation of roles for women of her generation. She no doubt already gets first dibs on juicy roles, but as Meryl once said when commending fellow actress nominees at the 2009 SAG awards, "everybody wins when we get parts like this." Deadline is reporting that Tony Award-winner Nina Arianda has been cast in Meryl's upcoming film Florence Foster Jenkins. Arianda will evidently play a showgirl by the name of Agnes Stark. Filming is set to begin next month with Stephen Frears directing. 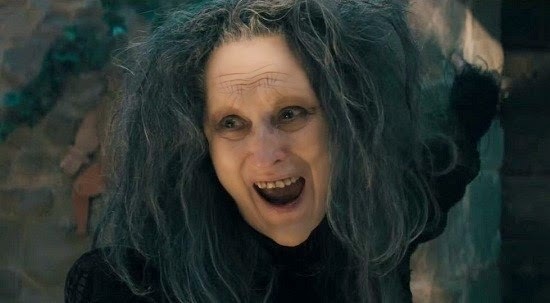 Well it may not be quite as prestigious as an Oscar, but Meryl took home the "Golden Popcorn" trophy for Best Villain for her role as the Witch in Into the Woods tonight at the MTV Movie Awards. I'm pretty sure she wasn't in attendance. According to Hitfix, the only other time Streep was nominated was in the same category for 2006's The Devil Wears Prada. Congrats, Meryl! Entertainment Weekly previews "Ricki and the Flash"
This isn't that big of a deal, but we've been pretty deprived of any news on Ricki and the Flash, so it was nice to see that Entertainment Weekly had a little preview online today. The article goes into a tiny bit more depth about the film's plot, even down to the types of songs we'll get to see and hear Meryl play on the guitar. Perhaps this little bit of press is a sign that the trailer isn't far off? In other news, last month Meryl's name was mentioned as attached to the upcoming Angelina Jolie pic Africa. Today, Deadline is reporting that the production of the film is in jeopardy due to "budget and creative issues." Meryl's participation in this was dubious at best, so we'll just have to stay tuned. Seems like a great story for a feature film, though.